Self-care. It’s one of those things we know we should be doing, but the idea of setting up a self-care routine can seem like just one more thing on the to-do list. Plus, when you look around the interweb, it's easy to fall into the trap of thinking that self-care requires a long soak in a tub filled with flower petals and crystals. Or a multi-step breakfast routine that involves 12 kinds of superfoods and a holistic nutrition degree. Or hours set aside each day to meditate, journal and work out. Yes, these are options within the practice of self-care, but they don’t represent the only way to care and nourish yourself. So instead, today we’re going to take a deep dive into getting started with a wellness routine. One that you can do and actually stick with, so you can take self-care off your to-do list and make it an essential part of your real life. p.s. Listen to the Feel Good Effect podcast episode on How to Create a Wellness Routine (You Can Actually Stick To) to take this next level! Gentle goal seeing at your fingertips. Let’s reframe self-care as self-compassion. As a way to let go of self-judgement and criticism and embrace your life with kindness and understanding, knowing that to suffer, fail and to be imperfect is completely, perfectly human. So why does practicing self-compassion matter? Research (1, 2, 3) has linked self-criticism with depression, anxiety, body dissatisfaction, and various other forms of psychological distress. Self-compassion is a way to disrupt self-criticism and be gentle with ourselves. And, as it turns out, being gentle with ourselves doesn’t make us soft, it actually makes us more resilient. Approaching a wellness routine grounded in self-compassion, then, allows you to forgive yourself when you miss a day or “fall off the wagon,” and will help you to build a sustainable practice that you can stick to over time. Let’s think of wellness in three parts: food, movement, and mental wellbeing. Yes, food is important. And yes, movement is necessary. But it’s the combination of all three that can really move the needle when it comes to your overall well-being. When we over-focus on one area at the detriment of the others, we fall out of balance. By focusing on all three areas you can create your own, well-balanced wellness routine that addresses all areas of what it truly means to be healthy. The all-or-nothing trap. We all fall into it one time or another. Maybe for you it’s in thinking about food. Or how often you work out. No matter how all-or-nothing thinking looks like for you, we know it reduces the likelihood of success and does not contribute to feeling good. Instead of all-or-nothing thinking, let’s focus instead on the parts and pieces you can do. Read on for more on how to do it! We know it’s important to start the day with a breakfast full of protein, healthy fats and plenty of fiber, but it’s a meal that’s often skipped or filled with tons of sugar or carbs. If you want your wellness routine to include eating a real food breakfast, use the journal sheet at the end of this post to set some Feel Good goals related to breakfast. Be sure to include your Ideal world goal, what’s happening now, your Gentle goal, Contingency goal, and a place to track progress (more on that soon). If you find yourself running through the drive-through or picking leftovers off your toddler’s plate, lunch may be a good meal to focus on as part of your wellness routine. 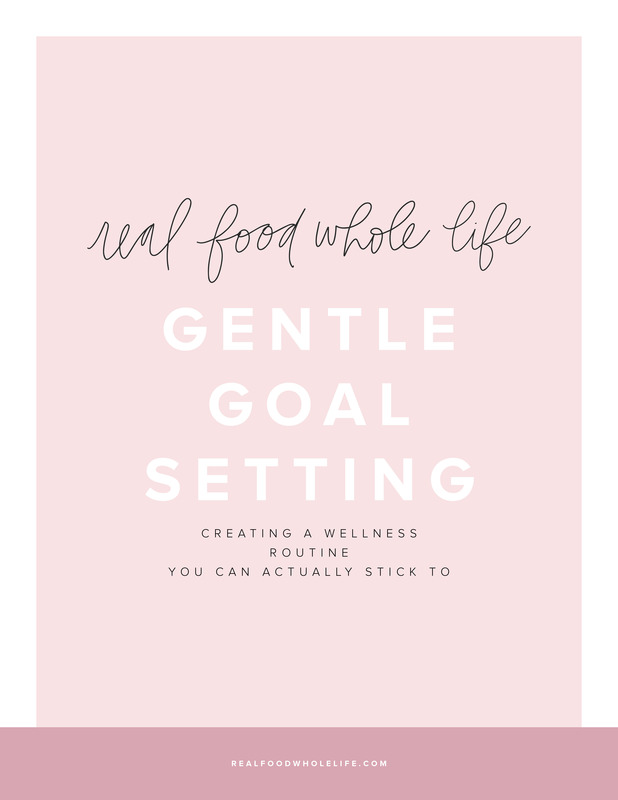 Use the journal sheet at the end of this post to set some Feel Good goals related to lunch, and be sure to include your Ideal world goal, what’s happening now, your Gentle goal, Contingency goal, and a place to track progress (more on that soon). Even if you have your breakfast and lunch game figured out, dinner can sometimes slip through the cracks, especially on busy weeknights. Use the journal sheet at the end of this post to set some Feel Good goals related to dinner. As with breakfast and lunch, include your Ideal world goal, what’s happening now, your Gentle goal, Contingency goal, and a place to track progress (more on that soon). As with food, movement is essential to any wellness routine. Maybe your goal is to add more movement to your day, or perhaps it’s to reduce the amount or intensity of exercise to focus more on connecting and feeling good in your body. Regardless of your goals, use the journal sheet at the end of this post to set some Feel Good goals related to exercise or movement. As you did with food, include your Ideal world goal, what’s happening now, your Gentle goal, Contingency goal, and a place to track progress (more on that soon). The last piece of establishing a wellness routine you can actually stick to is to track your stated goals and add a little self-compassion to the mix. So, for each Feel Good gentle and contingency goals (breakfast, lunch, dinner, movement), create a place to state your gals and to track daily progress. You can use the journal sheet provided at the end of this post to get started, or create your own personalized version. Now, and here’s the key, add a line each day to add a note of kindness. Remember that self-compassion part we talked about at the beginning of this post? Here’s a chance to put it into practice. If adding a note of kindness sounds silly, remember that most of us spend a significant amount of time engaging in self-critical or negative self-talk. to intentionally practice it on a daily basis. A wellness routine is so much more than individual acts of self-care. It’s about grounding your actions in self-compassion and focusing on the Wellness Trifecta: food, exercise, and mental wellbeing in an intentional way. By taking the Feel Good Goal Setting Process (download above!) and applying it to your own food, exercise, and mental wellbeing goals, you can craft a wellness routine that you can actually stick to and feel really good about doing it. Remember, this is all about what works for you! You don’t have to focus on all the areas described above, you can take this framework and use it to create something that works in the context of your life.